6-month-old Baby Syed was born healthy and his family was thrilled to welcome a second child, but sadly their happiness did not last long. Baby Syed has end-stage liver disease and his life is in danger. 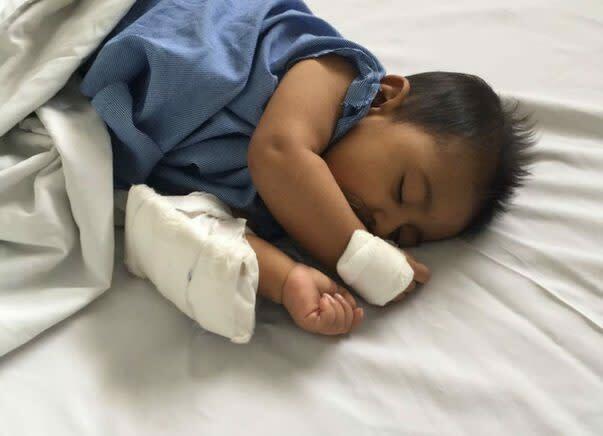 Baby Syed needs to undergo a liver transplant immediately to survive. Baby Syed is the second child of Azamathulla and Aysha, from Bhatkal, Karnataka. Three months back, his parents noticed that his body turned yellowish and they were terrified. He was already taking medication for low appetite and nausea. After many tests and scan, his liver disease was diagnosed. The only cure is a liver transplant. Azamathulla and Aysha decided to go to Chennai for treatment for a second opinion. The doctors again confirmed that only a liver transplant was a solution. His father has volunteered to donate part of his liver to save his little baby's life. Azamathulla is the breadwinner of the family and with his meager income, he has to support his wife, children, and his parents. He has sold off everything expensive that they had and exhausted his savings. Now he has gone back to home to do the paper work for the surgery. Doctor has give him 10 days to do the surgery and in this time, he has to arrange money for the surgery. 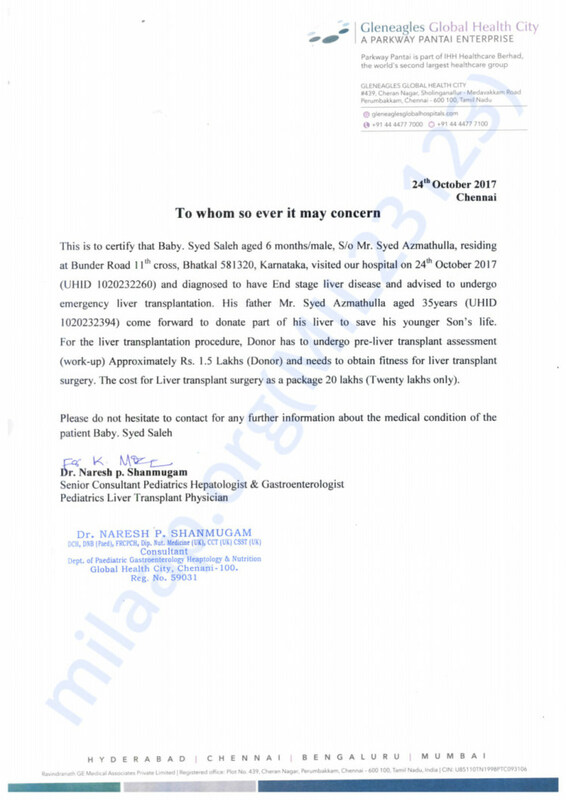 Azamathulla has to undergo pre-liver transplant assessment which will cost Rs 1.5 lakhs and the transplantation will cost Rs 20 lakhs. He has exhausted all his savings. 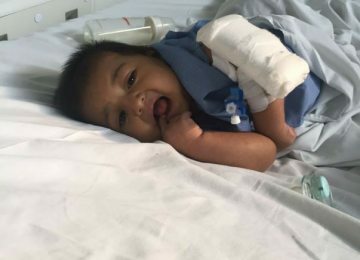 Now only your contributions can save this 6-month-old baby from this disease and help him get better. 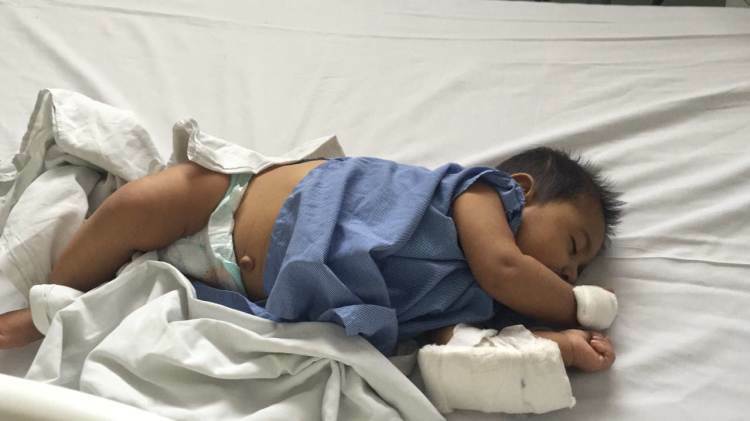 Baby Syed needs to undergo surgery before time runs out. Help him save his life.